V Findlay Wolfe BLOG: Simply Moderne! a Great Wave of pure energy and modern style, tracking the latest tendencies in the quilting world and celebrating creative fresh new ideas by young designers from all over the world ! (for the english version) ! Available at Barnes & Noble etc. 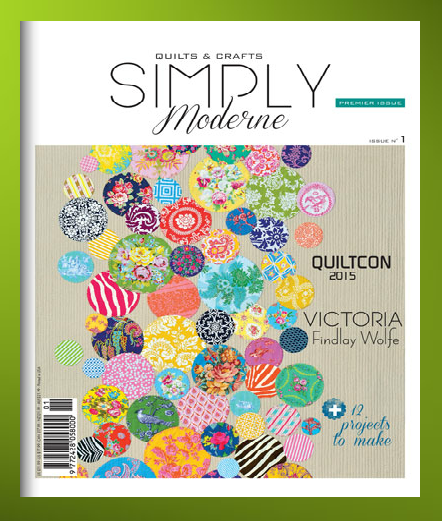 I'm happy to share that I have a quilt and article in this NEW magazine! I can not wait to see it in my hot little hands! 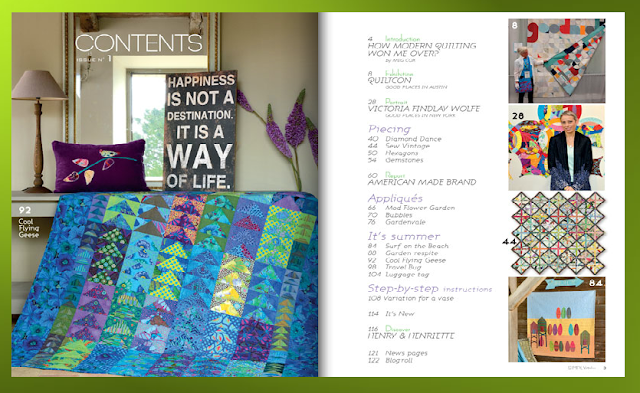 Here's a sneak peak at my quilt in the magazine, while it was still in progress. 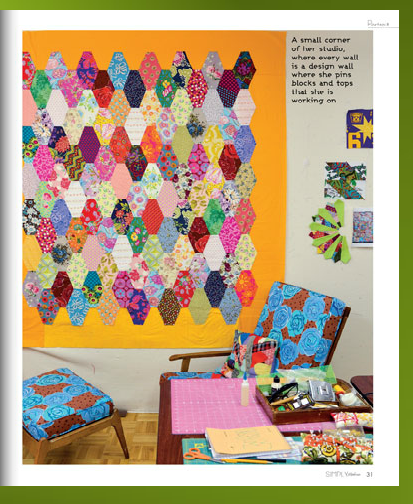 This a fun shot to see, (shown in the magazine) since that is the quilt I'm currently binding on this Texas trip!! I'm hoping by the end of this trip I will have another quilt top together, as give tips and tricks on this in my classes! 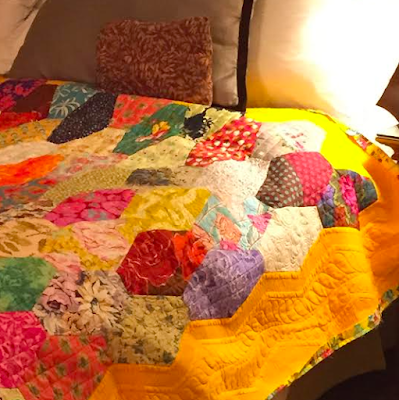 I get to sleep under it while I work on it... and it brightens up my hotel rooms! Bold, Bright, and zingy! Yay! Can't wait for this magazine to arrive in Australia! And my friend Rachaeldaisy is on the front cover which is so darn exciting!! I can't wait to see it too! Mine will be waiting for me in NYC, since I'm on the road until August 1st! I received it last week ( in french) and it was with joy that i had reading it. 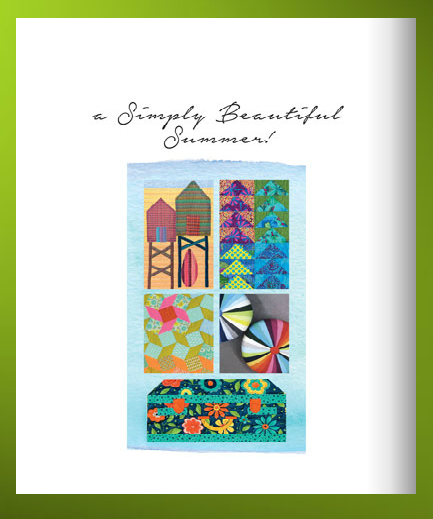 Do you think quiltmania will translate your books one day? i hope....Following you since many years, this magazine with you in number one was the good surprise . Bravo. Living in France, it was with sheer pleasure that I read / devoured this magazine; any plans to come and visit us in Fance to show us your jewels? Yes! Next year, September, I am coming with the Double wedding rings exhibit to the European Patchwork show, 2016! Thanks for your comment! That's excellent news! and lots of time to get organized ;-) I'm already looking forward to THE event, then. Thanks! Do you have this magazine in your online store? No I do not carry the magazines in my website shop.